Born in Toledo, Ohio, the first sculptures of Al Glann were fanciful creations on the family farm in central Ohio. Formal art training began in college where he graduated from the Columbus College of Art & Design with a 1973 BFA in Graphic Design and Illustration. Although he worked as a commercial designer and illustrator, Glann’s passion was in the creation of dimensional constructs and painting, composite relief, casting, wire sculpture, wood and metal. 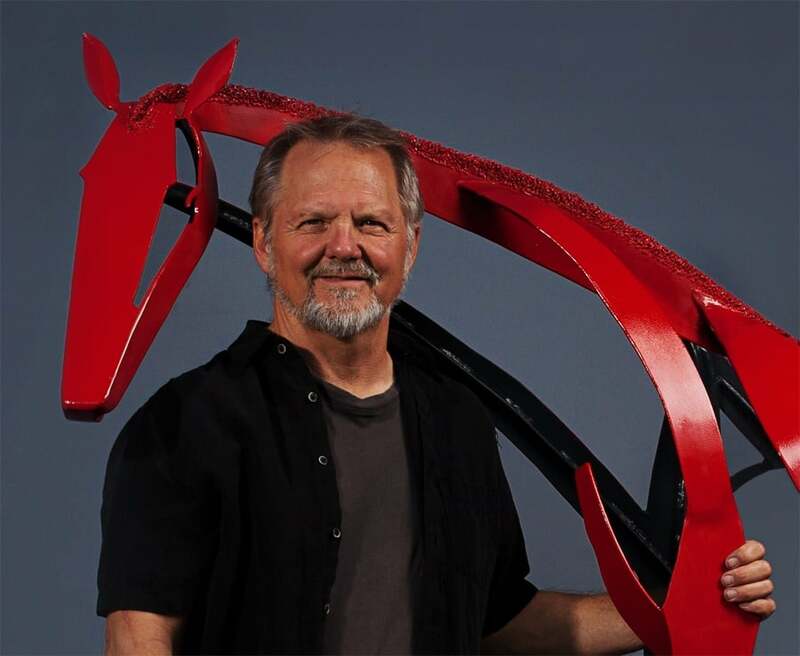 After 29 years of teaching art at both the Columbus College of Art & Design and the Art Institute of Phoenix Al decided it was time to focus all his energy on his sculpture and painting. In 2011 Glann moved his studio from Scottsdale to the Metal Arts Village in Tucson, Arizona. Since 2009 he has been expressing his love and respect for horses through his sculpture and painting. What started out as an exploration into anatomy, spirit, personality and physical action of the horse turned into a labor of love. There is a fascinating connection humans have had with horses throughout history. Man invaded and conquered foreign lands from the back of his warhorse and built civilizations with his workhorse hitched to a plow or wagon. Our partner for centuries, perhaps no other animal has served man in so many diverse ways. Horses were essential in the settling of the American West, they were used for mounted transportation, hauling carriages and stagecoaches, moving cattle, and inevitably for entertainment in the form of racing and rodeos. In creating his horses, they become a three dimensional gesture drawing, the majesty of movement, symmetry of strength and presence of spirit. Glann’s unique style is a fresh look to the traditional equine images. The smaller horses are initially created in steel; molds are then made from the steel model and then are cast in bronze. His works are in collections throughout the United States, Canada, England and Italy. Glann is represented in galleries across Arizona, Texas, California, Wyoming, and Colorado.